This on-farm trial explored the production and marketing potential for specialty melons in Franklin County. 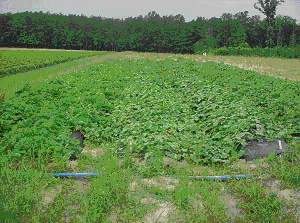 Nine different varieties of specialty melons were planted and harvested as needed. 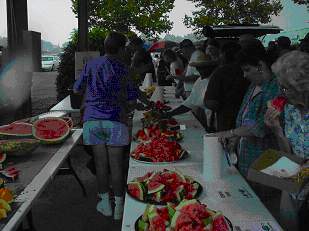 A specialty melon tasting at the Franklin County Farmer’s Market was held to determine public interest and preference. Taste tests and sugar content analyses were also conducted at the Vollmer Farm. Three out of the nine melons were selected for optimal production and marketability in Franklin County. These varieties are a good option for growers wanting to diversify farm production and income. A specialty melon trial was conducted at the Vollmer Farm in Franklin County with the help of a Specialty Crops grant. 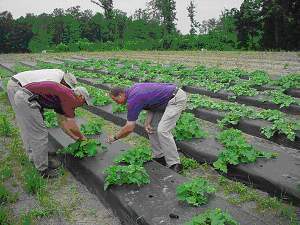 Nine varieties of specialty melons were planted on black plastic at the Vollmer farm in eastern Franklin County. Plants were started in the field from plugs and watered and fertilized with drip tape. Insecticides were applied as needed to control cucumber beetles. The following varieties were planted: Sprite, Duke, Golden Beauty, Honey Girl, Honey Pearl, Millennium, Gallicum, Sonora, and Sancho. The melons produced extremely well despite a few problems with mosaic virus. Several vegetable producers had the opportunity to visit the farm and taste as well as check the sugar content of the melons. A melon-tasting day was held at the Franklin County Farmer’s Market to introduce the public to the new melons. Three out of the nine melons were distinctly preferred for purchase at roadside or farmer’s markets. These three melons were Sprite, Golden Beauty, and Honey Pearl. Specialty melons are a good option for farmers wanting to diversify production and garner added income. Several farmers in the county have chosen to produce some of these melons in 2004 and have located seed. The growers have been educated on which melon varieties show the greatest potential according to market demand.